I’ve written before about the joys of an orchard during autumn. As I was jogging down our valley yesterday evening, I was hit with a warm rush of air laden with the scent of ripening fruit and all my senses were overwhelmed at once by what lay around me. I was reminded once again of just how lucky I am to be a part of this life and this industry and to live in such a beautiful part of the world. I am compelled once again to try and share the experience. Harvest on an apple orchard in the Adelaide Hills goes on for several months, beginning in the warm days at the end of summer and stretching right through to the very end of autumn. 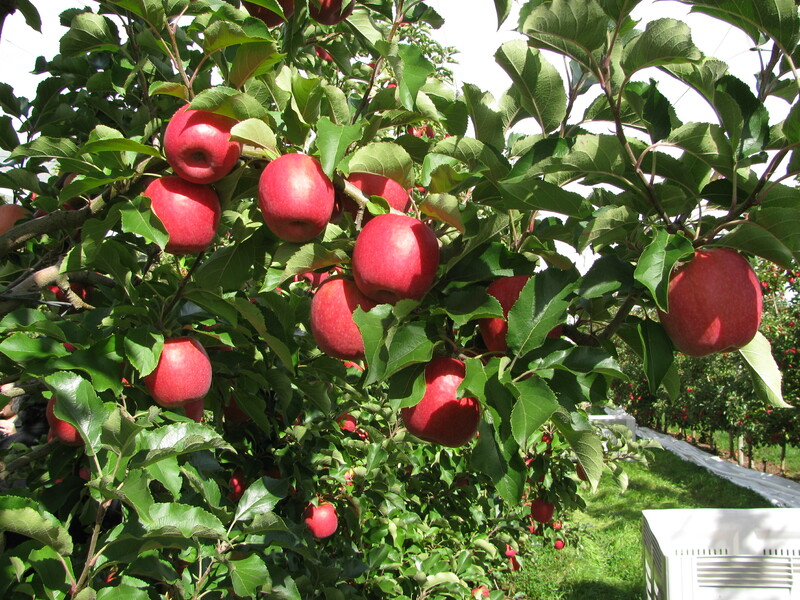 Different varieties ripen progressively over time, making the orchard a patchwork of colours, flavours and smells. Picking of the first main variety here, Gala, is nearly finished. 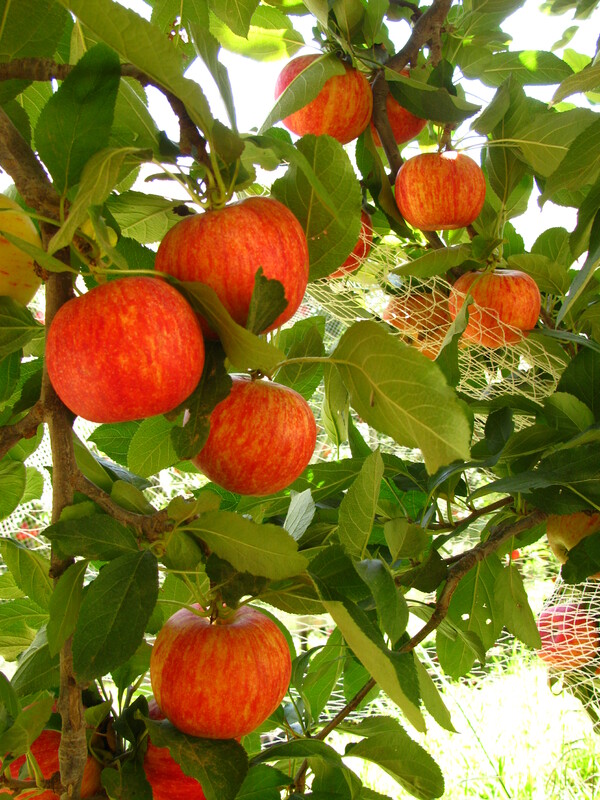 This is a deliciously sweet apple that to me has flavours that have been soaked up in the warm summer sunshine. It tastes of summer! 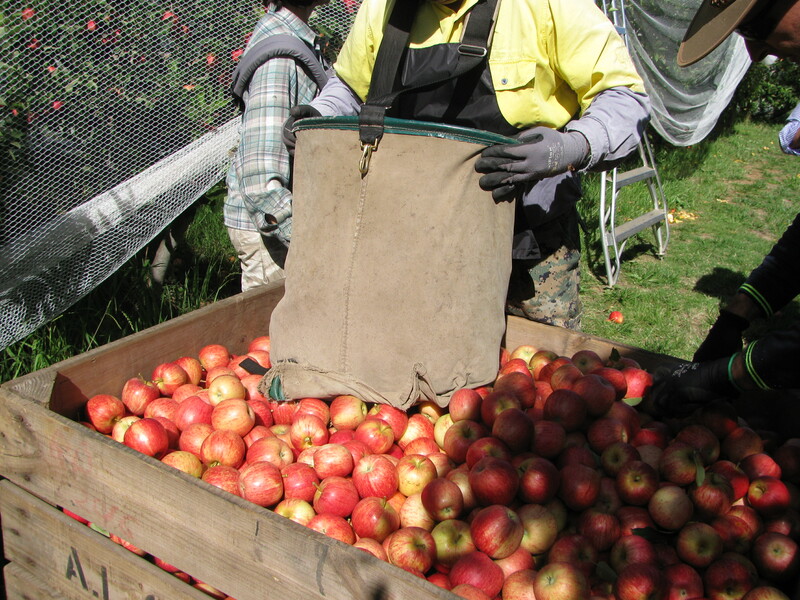 An orchard is a hive of activity during harvest; with a sense of busyness but also of care and camaraderie rather than rush; gangs of workers hand picking the fruit into picking bags, then gently emptying into storage bins. Every bit of care is taken to ensure the fruit is handled as gently as possible, looking after the fruit and also protecting the buds that are forming next year’s crop. Workers from diverse backgrounds and ethnicities make for fascinating conversations that ensure a long day of manual labour is never dull. Long standing friendships are often formed with people from all around the world. During picking season, the low, gentle tones of tractor engines and the hum of trucks provides a background noise that is not intrusive, but acts as a reminder of the constant activity. Tractors with fork lifts keep bins close to pickers and full bins are transported as soon as possible to cool rooms, where the fruit is cooled straight away to maintain its quality. Trucks are constantly on the move, transporting fruit bins between properties and packing sheds. At the moment the days are still quite long and warm, but they are quickly drawing in and the nights are developing a cool, crisp chill that signals the arrival of autumn. Dust hangs in the air during the day from the dry tracks, while in the cool of the morning, the thick, green grass within the orchard is laden with dew. In the shadows under the trees, the sun’s rays may not reach the ground for much of the day, creating cool pockets of air that contrast with the surrounding warmth. Conditions over the coming weeks will change quite quickly. 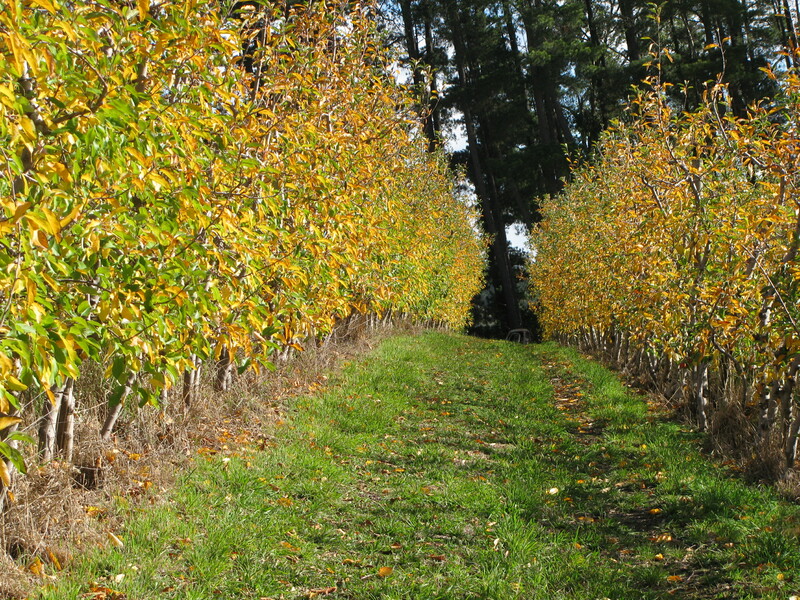 The harvested trees will soon begin the process of senescence and the leaves will begin to develop a golden hue. Discarded fruit will begin to ferment on the ground in the damp conditions, creating beautiful smells. In the meantime, as the weather changes along with the leaves, so the next varieties will mature and ripen. 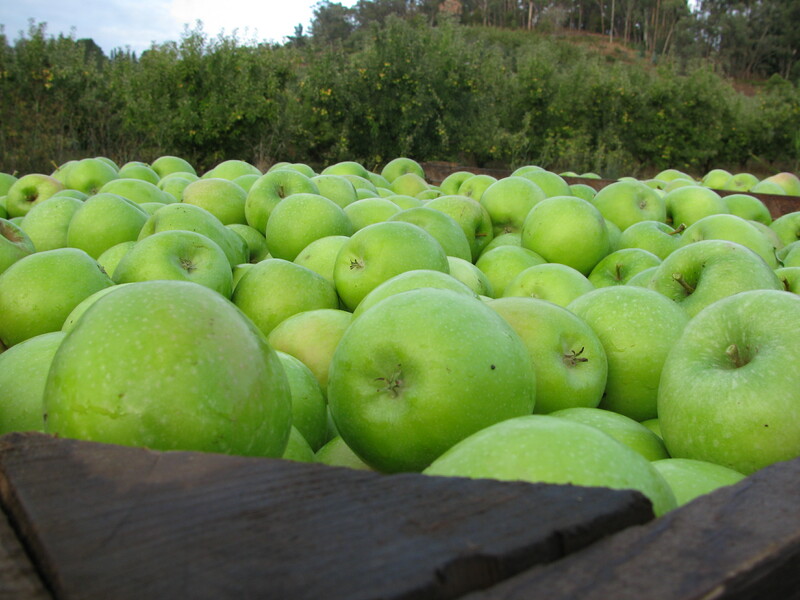 The juicy, yet tart flavours of the very traditional Australian variety, Granny Smith …..
And as the growing season draws to a close, the sweet yet acidic flavours of the much loved Pink Lady gradually develop in a complex balance that reflects a perfect combination of warm and cool autumn weather conditions over the long period of maturation. The sensations of an orchard during harvest period are all consuming and difficult to capture adequately in words and pictures alone. If you can have one experience in life, spending time in a fruit production area is one well worth considering. And I mean a real amount of time. Enough time to meander, relax and truly absorb. Enough time to experience the changing weather patterns. Enough time to soak it all up! 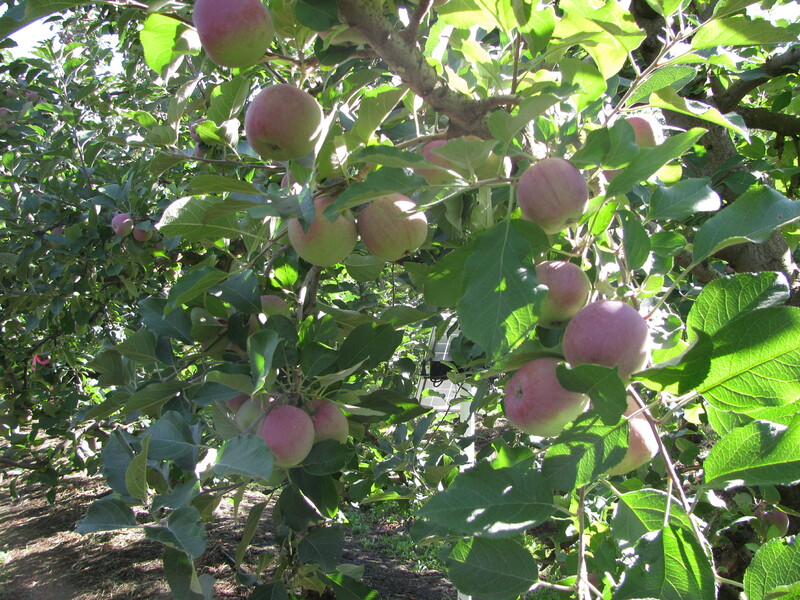 This entry was posted in Farming life, Food Enjoyment, The wonders of agriculture and tagged Adelaide Hills, apples, autumn, Fruit, harvest, Orchard by Susie Green. Bookmark the permalink.